Consider a three rotor system as shown is Fig. (a). 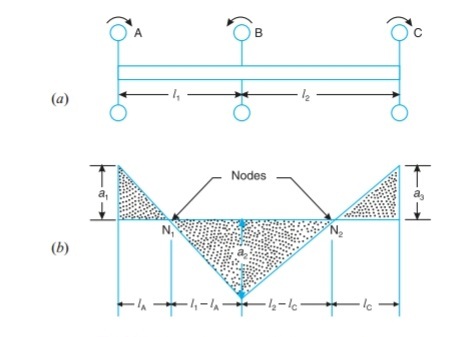 It consists of a shaft and three rotors A,B and C. The rotors A and C are attached to the free ends of the shaft, whereas the rotor B is attached in between A and C. The torsional vibrations may occur in two ways, that is with either one node or two nodes. In each case, the two rotors rotate in one direction and the third rotor rotates in opposite direction with the same frequency. Let the rotors A and C of the system, as shown in Fig. (a), rotates in the same direction and the rotor B in opposite direction. Let the nodal points or nodes of such a system lies at as shown in Fig. (b). As discussed previously, the shaft may be assumed as a fixed end at the nodes. Fig. Free torsional vibrations of a three rotor system. On substituting the value of lA from equation (iv) in the above expression, a quadratic equation in lC is obtained. Therefore, there are two values of lC and correspondingly two values of lA. One value of lA and corresponding value of lC gives the position of two nodes. The frequency obtained by substituting the value of lA or lC in equation (i) or (iii) is known as Two node frequency. But in the other pair of value, one gives the position of single node and the other is beyond the physical limits of the equation. In this case, the frequency obtained is known as Fundamental frequency or single node frequency. (1). A two rotor system has one natural frequency of vibration. (2). A three rotor system has two natural frequency. (3). Hence the number of different natural frequencies of a given system is one less than the number of rotors in the system. (4). In a three rotor system, for single node of lA > l1, then node lies between B and C . On the other hand if lC > l2 , then node lies between A and B.